Obanzai is Kyoto homestyle cooking; everyday dishes cooked using ingredients native to the area. According to Wikipedia, at least half of the ingredients used must be produced and processed in Kyoto. Seasonal produce coupled with a ‘waste not, want not’ philosophy means food is partaken at its prime. Emphasis is given to natural flavours and aromas with minimal seasoning. Another distinct trait is sweet white miso paste is favoured instead of the normal miso. Mukadeya(百足屋, literally meaning centipede house) is a 5 minute-walk away from Karasuma station. Apparently, the abode formerly belonged to a kimono trader before its transformation into a rustic restaurant. Its discreet façade with slatted screen barely hinted of what to expect inside. We had a glowing impression of Mukadeya thanks to the warm mellow lighting within. Upon entering the narrow entrance, we found ourselves in a little space decked with whimsical trinkets. 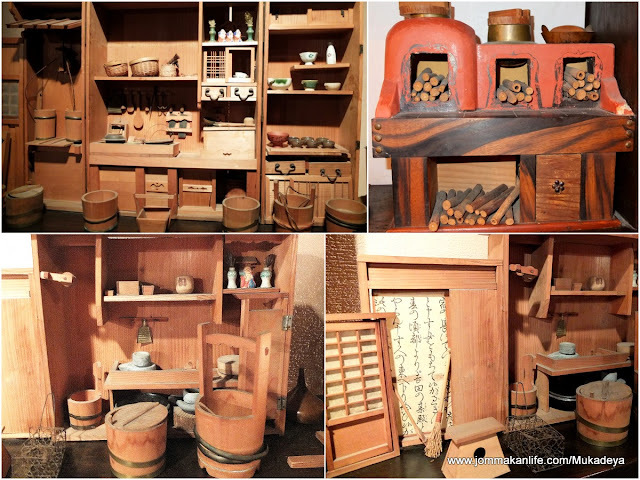 A sliding door led into a small dining square with display shelves adorned with miniature replicas of ancient stoves, larders and kitchen paraphernalia. Our meal commenced with two dainty bowls of appetisers: the first comprised a piece of sesame seed-speckled yam with a wedge of persimmon and boiled Japanese spinach while the second offering was a bite-size chunk of roe-filled sardine with kuromame (boiled black beans in syrup) and carrot chunks in sweetish shoyu. The appetisers paved the way for a lidded lacquer bowl containing savoury white miso broth. Arranged artfully in the soulful soup were a delicious crab meatball, a piece of fried beancurd and a floret of flowering spinach, a pleasing montage of delicate textures that raised our anticipation for the next course. 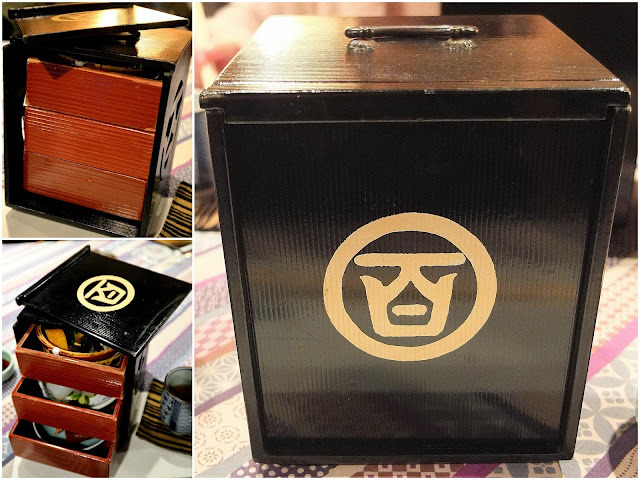 We were thrilled by the whimsical lacquer box which resembled a jewellery box. Upon lifting up the flap, we discovered it actually featured a stack of three compartments proffering a treasure trove of delicious morsels. Each exquisite dish was carefully prepared and presented to please the eyes and palate. The first receptacle held slices of tai (sea bream) and ika (squid) sashimi tricked up with shiso (perilla leaf) and hojiso, a sprig of tiny perilla flower buds. A piece of fluffy soft eggroll, a square of dojō (smoked loach), a ball of kurikinton (mashed chestnut and sweet potato), gomae (some boiled spinach with sesame paste) and a delicate roll of sweet shoyu-marinated kelp nestled within the second. Broiled anago (sea eel) brushed with tare (sweet soy basting sauce) and a stub of pickled ginger stem took pride of place in the third container. We had expected to dig into the ubiquitous steamed egg custard when a deep blue chawan with lid was placed in front of us. Imagine our surprise when we saw it revealed a lightly scorched, chewy glutinous rice ball with minced pork filling immersed in an unctuous savoury sauce. By now we were almost satiated but then a cast iron pot of nabemono appeared at our table. The serving was more than enough for the three of us as the hot pot was packed with chunks of radish and boiled spinach amidst cubes of salmon, yam and beancurd. Some yuzu zest bestowed bright citrusy notes to the soul-satisfying umami broth. Just when we thought the meal had drawn to an end, the restaurant's signature dish - steamed glutinous rice studded with black beans (a symbol of good health) was served. Paired with tsukemono: locally pickled hakusai (Chinese cabbage), daikon (radish) and umeboshi (salted Japanese apricot) accompanied by a cup of briny red miso soup, it left us replete. A cute bamboo cup of black sesame pudding with a dollop of cream brought our meal to a satisfyingly sublime conclusion. We felt well-fed minus the dreaded heaviness from a multi-course meal. Expect to pay about RM220-RM250 per person for dinner but the overall experience and food quality make it worthwhile.